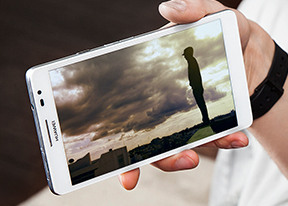 The Huawei Ascend Mate has an 8MP camera for maximum image resolution of 3264 x 2448 pixels. There's a single LED flash to go with it. The camera interface looks pretty standard - you get a still/video camera toggle, a virtual shutter and a shortcut to the gallery on the right. The fun stuff is on the left side - you get multiple shooting modes (we'll cover those in a second), color effects, face effects and general settings. Two other buttons in the viewfinder can toggle the front and rear cameras, set the flash mode and turn on/off the touch focus. The shooting modes include HDR, burst, smile and beauty shot, panorama and low-light. The group mode is pretty impressive - it managed to track up to 25 faces and snap five consecutive shots. After the snapshot's been taken, you can tap on any face and pick which of the five shots the phone should use - so if anyone blinked while you were taking the shot, you can correct it in a second. We guess it's the Scalado technology that powers the camera but Huawei say nothing about it. From the settings menu you can enable things like geotagging, red-eye reduction, gridlines and adjust the image settings. White Balance, ISO settings and scene selections are also available here. The camera offers reasonable levels of fine detail and manages to keep the noise in check. The colors are oversaturated but not too bad and the exposure is good too. One thing to watch out for is the autofocus accuracy - we had several shots (more than usual) which were out of focus. The corners of the samples are quite soft, pointing to somewhat inferior lens quality. Check out these HDR shots too. Keep in mind that you have to have a steady hand for those two to work properly. And here is a panorama sample. The Huawei Ascend Mate's main camera records videos at up to 1080p@30fps, while the front facer is good for up to 720p@30fps. The Huawei Ascend Mate qualifies for the 1080p competition that's going on in our Video Compare Tool. The results are on par with the Galaxy Mega 6.3 - there's a lot of color fringing, which is easily fixed in-camera for the stills , but obviously this sort of correction is not possible for video. Anyway, that effect isn't that noticeable in real-life scenes and they end up looking quite okay. Even in low light the videos are good.